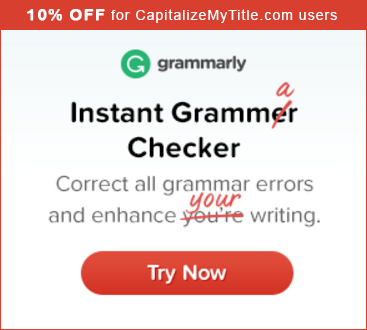 Ad-Free membership ensures you will never see ads again on CapitalizeMyTitle.com. These terms and conditions govern your use of CapitalizeMyTitle.com ("our website"); by using our website, you accept these terms and conditions in full. If you disagree with any part of these terms and conditions, do not use our website. You, as a United States Government entity, are required, when entering into agreements with other parties, to follow applicable federal laws and regulations, including those related to ethics; privacy and security; accessibility; limitations on indemnification; fiscal law constraints; advertising and endorsements; freedom of information; and governing law and dispute resolution forum. CapitalizeMyTitle.com ("Company" or "We") and You (together, the "Parties") agree that modifications to the CapitalizeMyTitle.com standard Terms of Service, available at https://capitalizemytitle.com/terms (the "TOS") are appropriate to accommodate Your legal status, Your public (in contrast to private) mission, and other special circumstances. Accordingly, the TOS are hereby modified by this Amendment as they pertain to Agency's use of the Company web site and services.